Can you provide more data (style, material, size) ? What style of bag do you need ? What should it be made from ? How big should it be (HxWxD) cm ? What colour is the bag ? Artwork or logo to be printed ? Uploading your artwork helps us to quote more effectively. How many will you need ? What is the final delivery date ? PRIVACY STATEMENT: We do not sell, rent or trade any information collected through this site from its users. Read our full statement. Hello and welcome to the bags section of this site. On this page you’ll find useful information about the bags we provided which can be branded or decorated with your logo or slogan.We have a range of standard bags in various materials and finishes and you can see some examples of those using the navigation on the left hand side. However, if these are not suitable for your project (many are not shown) we can have your bag custom designed and made to your specifications or it may be that we’ve already done it and its just not shown on the site.General examples of the standard bags we provide can be seen by clicking on the “Examples” tab above, however the left hand navigation provides more specific bag categories that may suit your project needs more closely.Use the form to the right to send in your bag enquiry or use the email address or telephone number. The customer service box towards the bottom of this page should appear when a live assistant is available to help you with your project in real time.We are here to help without obligation or pressure to buy so please feel free to ask any questions you may have. Also known as Kraft as the material is thicker like card. Supplied in many styles and finishes. More examples in the paper bag and carrier bag sections. Any. Standard covers 170gsm art paper to 250gsm coated board. To suit from long or short. Pantone matched colour. Inside and outside including 4 colour process and pantone matched. Everything you need to make your bag look great. †1 Prices based on > Qty: 1000. SIze: 260 x 330 x 100mm. Material: 100GSM kraft. Handles: Internal tape handle. Branding: Printed 1 colour to 2 sides. Delivery: Included to 1 UK address. Includes woven (WPP) and non woven polypropylene (NWPP) as well as standard plastic or polythene (LDP) bags. More examples in the plastic bag and carrier bag sections. †2 Prices based on > Qty: 1000. Size: 15" x 18" x 3" (Inches). Material: 180 / 360 gauge white LDPE. Handles: Punched out handles. Branding: Printed 1 colour to 1 sides. Delivery: Included to 1 UK address. Supplied in cotton, canvas and jute weights with or without lamination. More examples in the cotton bag and jute bag sections. †3 Prices based on > Qty: 1000. SIze: 380 x 420mm. Material: 5oz natural cotton. Handles: Internal tape handle. Branding: Printed 1 colour to 2 sides. Delivery: Included to 1 UK address. Qtable also supply a range of bags made from alternative materials like Bamboo and Stone. †4 Please contact for details. Do you provide wholesale logo bags ? Our core business is supplying in volume any of the products we source or manufacture and as such our pricing is wholesale. Are they cheap logo bags ? Well that depends on what you mean. Cost effective yes, becuase you are buying close to the manufacturing source. Cheap ? well that depends on how you define cheap. A lot of cheap bags will fall apart very quickly and may not give you the return you are looking or address the social concerns you may have with your bag investment. Can you supply low to no minimum logo bags ? There is no black and white answer here because making or printing anything requires equipment and people. Each job requires a certain amount of work to setup up the machine and prepare artwork for reproduction specifically for each and every job. This is a fixed cost which is the same, no matter the volume you purchase, so the more you buy the lower the price becomes. Because of this, if you want a very small volume, depending on the bag it may make economic sence, although we can supply it. Will you deliver my logo bags with our colours ? Only if you ask us too! Yes, that is what we do best. 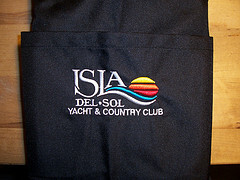 Personalising details of the bag to your individual requirements. With some bags we can customise more than just the print. For example we could match the trim colour of the bag or handles colour to the colours in your Logo. Cool huh! Would I be able to get a custom logo bag ? Ok, thats fine. As well as putting your logo or branding onto bags we also design and make bags to order. Once we have a good idea of what you are trying to achieve and any constraints such as material, budgets, time scales, colours etc. we can set about generating a delivered price for your dream bag. What other bags do you do ? The are no testimonials that match your current filters. Add some testimonials that meet your filter requirements and check again.